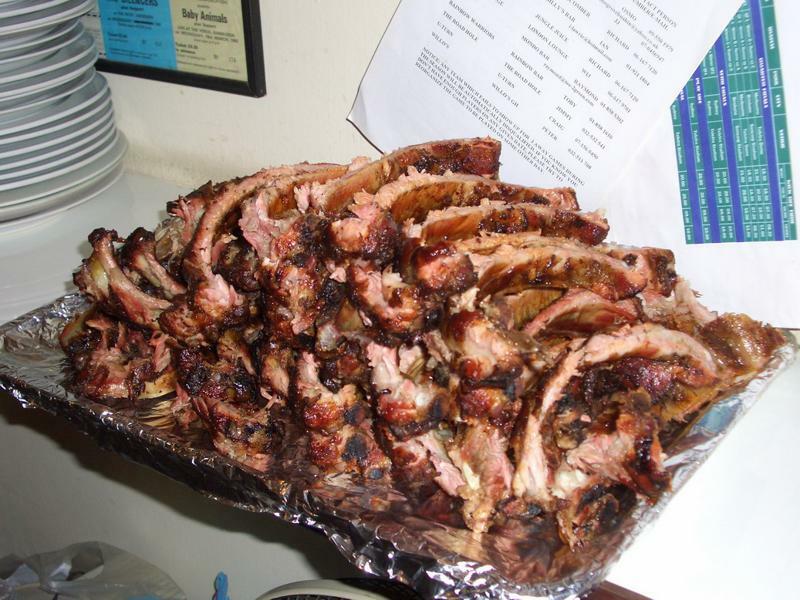 It's rib season again and Billy's Bar and Restaurant is having a Rib Night on Friday, October 2. You can order a 1/2 rack or a full rack of these tasty smoked ribs or as many racks as you need. All come with salads and can be ordered to go or to eat at Billy's. For more information, go to Billy's page or stop by the pub and talk to Billy. Orders should be placed by Wednesday evening. In a post last week FBF mentioned that the ASEAN Summit was going to happen in a matter of days. Well, time flies when you're having fun and even more so when you're so old that keeping up with the years is difficult and the months are downright impossible and the days just get lost... But, no matter, the Mrs. is never sure what season it is and she comes from a family of agriculturists. FBF is sure that this will be as effective as the recording of cell phone numbers led to the dramatic decrease in bombings in Southern Thailand and the smooth crossing of the US borders when special ID cards were issued to those who live along that border. OK, they're just doing their job in the best way they know how. If the best laid plans just worked once in a while the world would be a better place, once in a while. In the meantime, they lay plans and we poke fun. Be a good scout, register your cell phone and car and be careful out there, the ASEANs are coming. Do You Know David K. Smyth? Since October of 2008 there have been a few posts on the web about Gerald Chester McAfee AKA David Nathan Ward AKA Dennis Kennedy AKA Thomas Guthrie AKA Jerry Griffith AKA David K. Smyth and possibly at least one other alias. Teakdoor has posted here and ThaiVisa has a post here about the arrest in Thailand in 2008 and subsequent sentencing in the US in 2009 for the 1985 embezzlement of funds from College Hospital in Downey, California. Both of these posts quote an L.A. Times post here. Over the years, the FBI periodically sought the public's help in locating McAfee. At one point the bureau put the handsome, wavy-haired former swimming coach on a wanted poster that listed five of his alleged aliases. But the case was essentially gathering dust until last year when a tipster informed the bureau that McAfee was living in Thailand. Special agents at the U.S. Embassy in Bangkok, working with Thai police, traced McAfee to a condominium purchased under the name David K. Smyth. A check of immigration records revealed that Smyth's passport bore McAfee's photo, authorities allege. 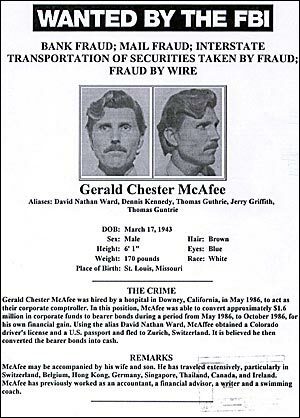 McAfee, now 66, was indicted in absentia in 1987 on bank fraud, mail fraud and other charges. A 2007 tip led FBI agents to Thailand, where McAfee apparently married and had children under the name David K. Smyth. After spending eight months in a Thai prison, McAfee was extradited to Los Angeles last year. McAfee could have faced up to 65 years in prison if he had been convicted on the charges. In a 20 minute speech, McAfee begged the judge to allow him to immediately return to his family in Thailand, saying "the man you see before you now is not the foolish man who committed the crime in '86." But U.S. District Judge Manuel L. Real rejected his request, saying, "this man has not been truthful for most of his life." McAfee brought up his military record, telling Real he had served in Vietnam in the early 1960s with the Green Berets. "I am humbly pleading and begging for mercy — not for me, for my children," McAfee said. Real had just one question: "What happened to the million?" McAfee replied that he'd spent it all within five years of taking the money. He'd been working in Bangkok as an English teacher at an American school until his arrest. On both the ThaiVisa and Teakdoor forums, there are comments about the scam and how he got caught etc, but no one seems to know McAfee though he spent many years in Thailand as an English teacher in Bangkok. FBF has recently learned that McAfee may have had another alias and the folks who knew him under this alias had no idea he was an English teacher. FBF would very much like to know if anyone reading this recognizes the gentleman in the photo above or an English teacher going by the name of David K. Smyth bearing any resemblance to the man in the photo. It is well documented that there is another David (but A.) Smyth in and out of Bangkok who is a respected academic in the Thai language. No need to mention him but if a TEFL or other English teacher happens to read this and knows of a David Smyth, FBF would very much like to hear from you. Also, if you know of any Thailand based TEFL forums where someone might know of David K. Smyth, it would be very much appreciated if you could post a link there to this post. Again, FBF would very much like to hear from anyone who has ever worked with, rode to work with, drank with or whatever with anyone named David who resembles the fellow at the top of this page. Thanks. Plearnwan, the box of corrugated tin near Soi 40 seems to be closed temporarily for expansion. This is probably why we see more Bkk cars wandering around aimlessly. I've heard no more news about the ferry between Hua Hin and Pattaya. That really doesn't surprise me but if anyone hears anything new, please let us know. Transport: The VIP bus between Korat and Hua Hin now has 5 trips each day, starting at 0830 through 2200. The new minivan service between Hua Hin and Victory Monument in Bangkok is run by BKS and has at least one trip each hour between 0400 and 1900. Moving the location for the music festival proved to be as big a headache as having it near the railway station. Why they don't do these things at 19 Rai is beyond me. The ASEAN Summit is coming up in just over a week so make sure you've got the correct color shirt on.